MMA superstar and World Series of Fighting analyst Chael Sonnen spoke with light heavyweight (205 pounds) star Vinny Magalhaes as well as World Series of Fighting Senior Vice President Ali Abdelaziz before the “WSOF 24: Fitch vs. Okami” world championship doubleheader event that takes place tomorrow, Saturday, Oct. 17, live on NBCSN at 8:30 p.m. ET/5:30 p.m. PT from Foxwoods Resort Casino in Mashantucket, Conn.
Magalhaes (12-7) of Las Vegas, Nev. via Rio de Janeiro, Brazil will take on Matt “The Hammer” Hamill (11-5) of Loveland, Ohio in a featured bout on the five-bout NBCSN telecast. Sonnen will call his second World Series of Fighting card on Saturday night, alongside veteran play-by-play man Todd Harris. 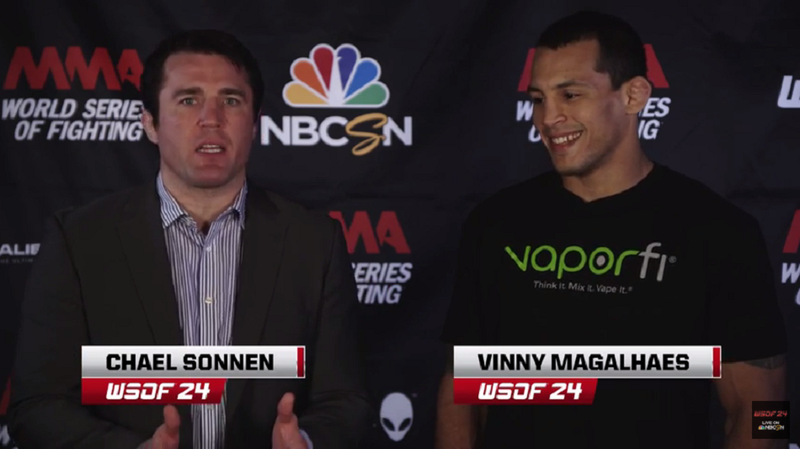 Sonnen speaks with Abdelaziz about the star-studded “WSOF 24: Fitch vs. Okami” fight card.